Google's chief executive Eric Schmidt has waded into the debate around Google Buzz, insisting that the company's biggest failing was not explaining to users how the service would work. Google Buzz's product manager Todd Jackson made an apology for the issues around the new social networking system from the search giant, which include questions about privacy. But Schmidt is quoted in the Guardian as telling phone executives at Mobile World Congress that people had jumped to the wrong conclusion with concerns that personal details had been shared. 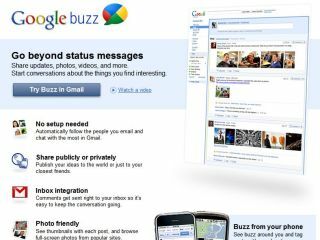 "I would say that we did not understand how to communicate Google Buzz and its privacy," he said. "There was a lot of confusion when it came out on Tuesday, and people thought that somehow we were publishing their email addresses and private information, which was not true." "I think it was our fault that we did not communicate that fact very well, but the important thing is that no really bad stuff happens in the sense that nobody's personal information was disclosed," he added. The real issue came when people discovered that, at launch, the system had automatically signed them up to follow their most common Gmail contacts. This led to a slew of complaints and major changes to the way that Buzz worked, as well as an admission at Google that things had not gone to plan.